The Plowline Pattern is up! You can download it from the Garment House Shop, Ravelry or directly from here. I am also trying out seamless checking through my shop now, eliminating having to go through Paypal. I'm pretty excited about it, but make sure to let me know if you experience any problems. I'm so, so close to releasing the Plowline Raglan Sweater pattern! After consulting my company's computer guy (ha, shockingly underpaid husband), I finally got my PDFs looking the way I want them to. Apple does a terrible job resizing their documents making the graphs hardly legible, but I think that's ironed out now. I might go back and do the same for all my other patterns and provide an update for those of you who have already bought them. A little bit about the Plowline. I plan to release it sometime early next week, and for now it will be released in one size, Garment House Medium (size 6-8). I will update the pattern to include all sizes in a while, after I've had a chance to get some feedback about the pattern as it is now. I'll be offering this one-size pattern at a discounted rate until then. 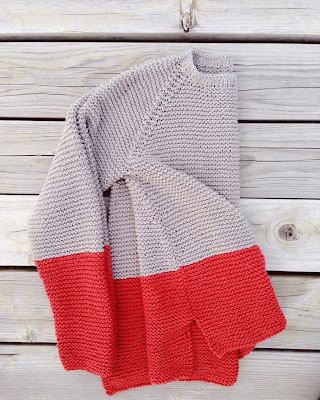 You have all been so kind about the Garment House knitting patterns so far, thank you! It's something I've wanted to do for a long time, even before I asked if anyone would be interested in the Downton Sweater I hoped to release last year. If this Plowline release goes well, that's the next sweater pattern on the list! Thank you! And let's talk hot water bottles. I meant to post on this earlier, but couldn't find an extra minute anywhere! Thank you for participating in the Garment House Giveaway! I got a hold of all the winners last week and the most amazing thing happened - almost every single one of them personally wrote back and thanked me! It was such a kind gesture, and a fun way for me to participate in the excitement about their upcoming knitting project! I get the same way before I cast on, and hope these patterns ignite the desire to knit a handful of great projects this fall and winter. I can't wait to see how all these patterns knit up for you! I myself have had to finish a bunch of Hot Water Bottle Covers and Teapot Cozies as gifts for various people over the last couple weeks, and as satisfying as these quick gifts can be, i'm really looking forward to starting a winter-long project for myself. It will probably be a sweater, and preferably some one else's pattern! Eventually, i'll knit another version of my Plowline Raglan, but for now, i'm happy with the one i've got. And now that the giveaway is over, I can focus on sharing that pattern with all of you! Now for the thrilling part of my post that I know you've all been on the edge of your seats to discuss - hot water bottles. I've had some questions about which hot water bottles I buy. This is an excellent thing to ask, since I'm still on a hunt for a favorite. Out of the four I own, I was given one that I feel is quality worth buying again, but I haven't been able to track down where to get them. Some i've purchased have been too thin, and I like them a little sturdier, a lot have had an awful plastic smell that only gets worse when hot water is poured into them, and a couple have a warning printed right on them not to use with boiled water! I don't know about you, but I like that bottle as hot as I can get it and want it to retain that heat all night if possible! I've been reading Amazon reviews trying to find a bottle that is worth buying in bulk so that I can just have a stack on hand to avoid those crazy last minute treks to every pharmacy within a 50 mile radius whenever I need a get well or house warming gift. Fashy has some good looking bottles that come in such great colors, but a lot of the reviews say they are children's size (What?! They sell children's size bottles?! Mini things! I want them!). Sänger has some great colors too and the quality looks good, but there are no reviews to be able to tell. I recently bought two super cheap Mabis bottles locally, but I wasn't terribly impressed with their quality. They weren't the ribbed ones Amazon sells, so maybe those are a bit better. I'm holding out hope for these Graham Field bottles since you can in fact buy them in bulk! I'll keep searching and pass on any info I find, and if you get a chance, I'd love it if anyone left their recommendations! this week has been a little nuts, but i haven't forgotten about the giveaway! i haven't had any extra time to let everyone know, but i've extended the promo (obviously), and plan on choosing some winners either today if i can find the time, or monday. in the meantime, go ahead and comment if you haven't already. 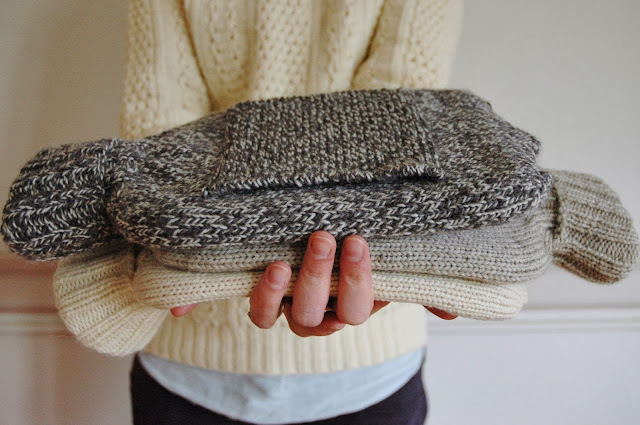 also, i'm wrapping things up on this plowline raglan sweater pattern! the pattern itself is done as much as i'm going to fiddle with it for now, but it will be nice to have the giveaway over before i move onto something new. thank you for all the kind words about the pictures and the sweater so far. getting photos at 23 weeks pregnant without looking like i just ate thanksgiving dinner was a challenge! another knitting pattern is ready for download! First of all, thank you for buying the Garment House Hot Water Bottle Cover pattern! Wow! I'm so thrilled to have your business after such a long hiatus from the shop, and cannot wait to see everyone's hand-knit work! Can you tell by the patterns i'm uploading it's been cold? Really, really cold? As I sit in a frigid office, I find myself piling on every test knit item I have in my pack mule's worth of stuff I haul from the house to the office every day. I even have a very hot water bottle in it's cover on my lap. And another on my back! It pays to be a knitter. 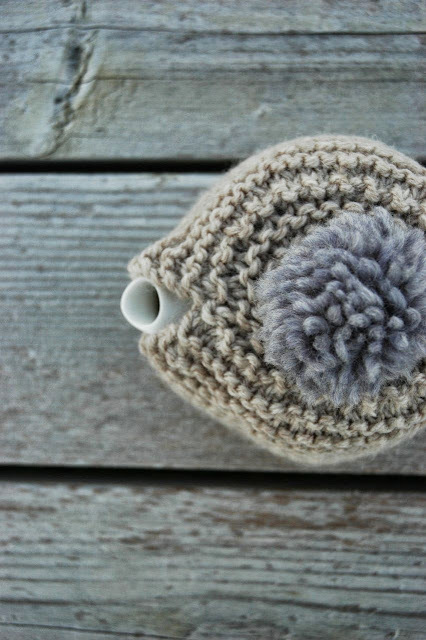 Pattern download number two, Small Teapot Cozy, is ready and waiting in the shop! I have been meaning to share this pattern for a while, and knowing full-time tea drinking weather is on it's way, now is the time! This project is incredibly fast since it's knit with chunky yarn, which also makes it extra insulating for your teapot. I use it with my ForLife "Stump" Teapot (which i highly recommend), but it will work with most two-cup (16-18 oz) teapots. This pattern is perfect for beginners since it's knit flat in garter stitch, meaning you don't have to use one purl stitch to make it! But really, what knitter doesn't like a simple and quick knitting project? 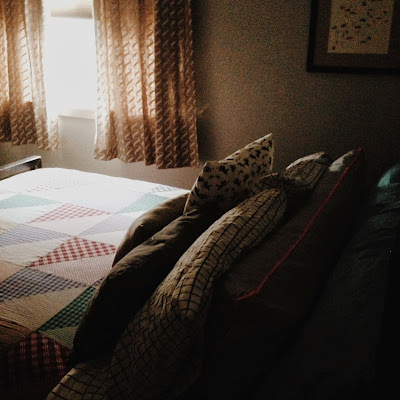 More patterns are on their way, but for now, i'm going to pile as many quilts and blankets I can find on top of me for the weekend, and catch up on some more knitting. Thank you for your business, friends! it's been quiet on here over the last couple weeks, but i've been hard at work! my days have been full of making list after list, going through stacks of notebooks filled with my knitted designs, test knitting until my fingers are about to fall off, taking photos in hurricane-speed winds, retaking photos, editing photos, changing layouts, and trying hard to wrap up this first set of garment house knitting patterns for release! i'm getting close. some of the bumps that have come up along the way have been really challenging and tough, but i'm thankful to just keep pushing through, learning as i go. it keeps me from freaking out about how nervous i am to actually share my patterns with everyone! i've heard some horror stories and even had some discouraging experiences already, but i've also heard some really encouraging things too. i hope the good outweighs the bad, and all this hard work will be worth it. but good news! to test this [new to me] process of downloadable patterns, i've brushed off my water bottle cover pattern, revised it, and am now offering it as a PDF for sale in my garment house shop. i've changed a couple things about the pattern for the better, but as always, make sure to let me know if you find any errors. 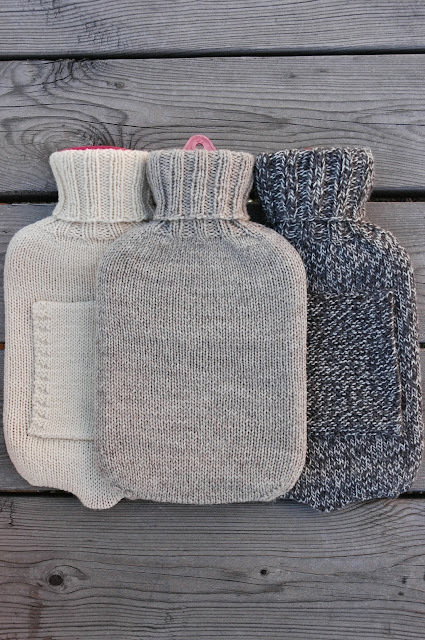 i don't know about you, but we're in full-blown hot water bottle season in our home! it has been snowing all day, and thankfully i have a bunch of newly test knit covers to make sure there's one for every bed in the house. i kept seeing people post tempting pictures of galettes on instagram this weekend, so by labor day, i finally broke down. we had a couple of apples from our friend's apple tree that were just on the edge of being too soft to bite into, so it was perfect timing. this dessert was so simple and satisfying, and was an appropriately american dessert for a holiday weekend. besides needing some direction on baking times from epicurious, i made this up as i went. 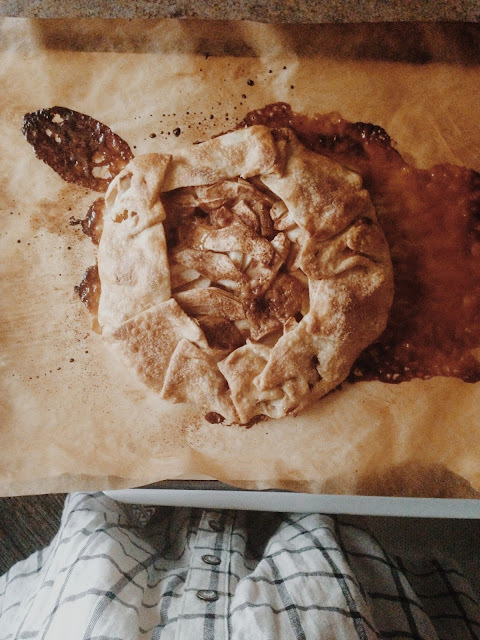 mix apple filling together and carefully wrap into the pie crust without tearing. brush sides with milk and sprinkle with sugar. bake in a preheated 450 degree oven for 20 minutes, then lower the heat to 375 degrees and bake for another 30 minutes, or until crust is dark golden brown. cool for 10 minutes. once the caramel that has melted out of the galette cools, break and stick into ice cream or tops of sliced galette. enjoy!